Sir Tony Hawkhead and Paul Rew appointed as Non-executive Directors to the Department. 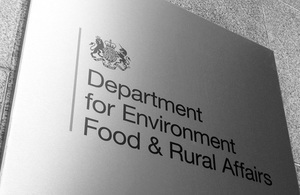 The Secretary of State for Environment, Food and Rural Affairs has appointed Sir Tony Hawkhead and Paul Rew as Non-executive Directors to the Department. They bring with them valuable experience and expertise from both the third sector and business. Sir Tony Hawkhead is Chief Executive of Groundwork UK and in 2003 was awarded the CBE for services to the environment. In 2011 he was further honoured with a Knighthood for services to environmental regeneration. Paul Rew is a non-executive director of Northumbrian Water Group plc, the Met Office and the Sustainable Development Commission and chairs their audit committees. He was formerly a partner in PricewaterhouseCoopers and led the PwC Sustainability and Climate Change Assurance business. The appointment of new non-executive directors is one of a number of changes announced by the Government in May 2010 to ensure that expertise from outside Government continues to help departments become more business-like. The Supervisory Board is chaired by the Secretary of State and meets regularly, bringing together ministers, senior officials and non-executive directors. The non-executives will provide advice; supporting as well as challenging the Ministerial and management teams on issues such as performance, the operational or delivery implications of policy proposals, and on the effective management of the Department. Tony Hawkhead is Chief Executive of Groundwork UK, a charity with national reach across England, Wales and Northern Ireland. Today, Groundwork has a £140m annual turnover and delivers 6,000 projects a year. Sir Tony chaired the Department for Work and Pensions Third Sector Welfare to Work Taskforce, which reported in 2009, and was a member of the Local Government Association Climate Change Commission in 2007. Paul Rew is a member of the Advisory Board of the Business School of the University of Exeter. He was formerly a partner in PricewaterhouseCoopers with 36 years experience of providing assurance and advice to a wide range of companies and was the sector leader for Energy and Utilities and for Renewables.